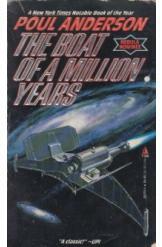 The Boat of a Million Years by Poul Anderson, Sci Fi. Book is in good condition, all pages intact. For all of human history, a tiny group of immortals have lived among us. Now, in the far future when immortality begins to spread throughout the rest of mankind, these ancients depart in a spaceship of their own making to find their own destiny.